Theodore the tugboat starred in a local children's show which quickly caught the attention of many children and Theodore soon became famous, not only in Halifax, Nova Scotia. The man who created this show lived a simple life who enjoyed watching tugboats and telling bedtime stories to his son. These stories were heard and Theodore the Tugboat soon became a famous show followed by a line of toys, books and a life size creation of the tugboat. Today, people visiting the downtown core of Halifax, Nova Scotia, can stroll along the harbour waterfront where they will find the famous tugboat, Theodore. 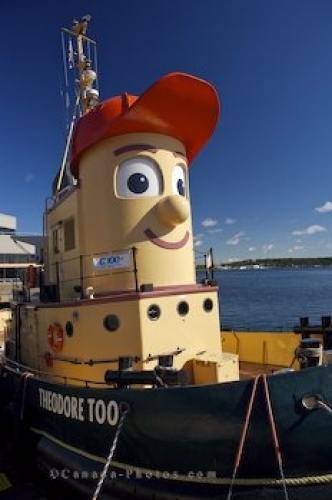 Similar to the television show, Theodore the tugboat will take passengers around the big harbour in Halifax for a one hour tour to see his friends. Theodore can also be booked for birthday parties, other special events and private charters for those who carry a special place in their heart for this tugboat. Picture of the famous tugboat, Theodore, docked in the Halifax Harbour in Nova Scotia. The Halifax Harbour has become a permanent home for the tugboat and tours run from the middle of June through till October. The tug boat Theodore Too on the waterfront of downtown Halifax, Halifax Metro, Halifax Harbour, Nova Scotia, Canada.